There was a little metal shed here that I’d hoped to use to store hay and grain, but the goats made quick work of that plan. They knocked the door off in about a day and a half, so so much for having a secure place safe from them. 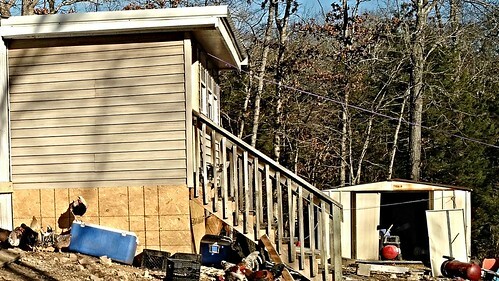 Then there was a lot of lattice siding under the porch, which they of course knocked down and trashed in short order. Then once they had that all destroyed, they were working on the siding of the house, because why not. Not much else to do all day! They do go into the camper, so I do have some place to feed them hay that is safe from the rain, for example, but for loafing, they don’t like it. 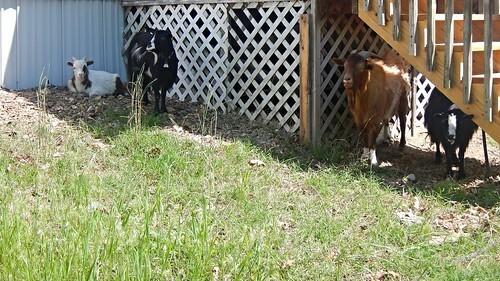 Trying at the last minute to get them someplace for the winter, and making sure that it was goat-proof, this bit under the porch is what I came up with. That was knocked together pretty quickly, and the opening is on the other side, but it gives them a secure place from the weather, and they love it. I’ve been feeding them hay in it, so the rocky ground that we have so much of is getting padded, at least. Man, I want a barn. This entry was posted in Fainting Goats. Bookmark the permalink. Post a comment or leave a trackback: Trackback URL.